You may have heard of LearnBop if you have kids in the public school setting, but I’m excited to tell you they now have a homeschool option as well! My family received a 12 month subscription to their LearnBop for Families in order to review it tell you all what we think! They have the option for you to get a subscription for a single student or a family. The family subscription gives up to four students access to the program. LearnBop is a self-paced online math program for students in grades 3 through 12. You can think of it as your child’s very own online math tutor! All you need is internet connection. No downloads or special apps are required. 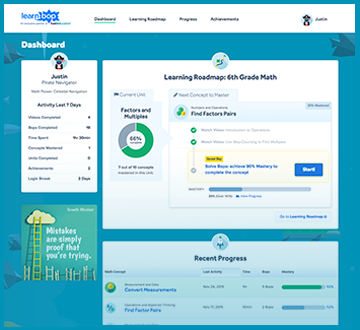 Virtually any student can use this program… whether the goal is to catch up, get ahead, make sure you are ready for a test, or to use during the summer to avoid losing math progress you made throughout the year. The program is adaptive in real time. What that means is that as the child is working on his/her math, the program will adapt to what he/she is doing. So, if your child is not understanding a concept, the program will self adapt to teach that concept more or in a different way. It will also catch learning gaps in your child’s knowledge. As your child is working, the program will identify if your child doesn’t know a key piece of knowledge that he needs to know in order to do the current work. Before your child begins in the program, he will take a test to determine what concepts and information he already knows and where he needs to begin in the program. The program then gives your child a “roadmap” to begin working. The roadmap is what your child will be working on while in the program. 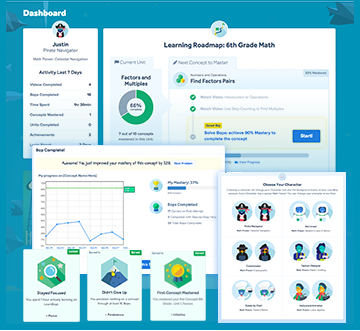 The program automatically sets you up with a roadmap according to your child’s grade level, but you can also have roadmaps laid out according to subject. So, if you child needs help specifically with multiplication concepts, you can set up that roadmap for him. Once the roadmap is set up, he watches videos to learn a concept. After watching videos, he works on a set of problems to make sure he understood the information in the videos. It’s really easy for your child to see what he needs to do next. The dashboard shows what has already been done and then you just click on the next thing. In the picture below, you can see that the child has watched the first two videos. He just needs to click on the blue start button to continue the learning. I had my two youngest kids take the assessment tests to give them roadmaps for the program. The assessment test was too hard for my youngest and so I thought I would just have her not do the program. That being said, when I made that decision I didn’t realize I could choose certain subjects for her to do. While the grade levels for LearnBop starts at 3rd grade, the subjects start at 1st grade. So, if your child needs extra help in a certain subject, he could potentially work on subject matter in 1st or 2nd grade to help get him caught up to the “correct” grade level. Anyway, the main child that used this was my 6th grade son. He chose his avatar (there are quite a few to choose from) and then took his assessment. Once his roadmap was made, he was able to start on the program. When he logged in to the program, he would watch the videos and then he would do the “bops”. The Bops are the math problems he would do in order to see if he understands the concept he is currently working through. As he was working, he would earn achievements for things like watching at least 2 videos before starting practice, mastering his first concept, and staying focused. There is a separate parent dashboard where I can see what he has done, the progress he has made, achievements earned, and so on. I think this is a great program to work on concepts that your child needs help with mastering. I personally think I like the subject roadmap better than the grade roadmap, but I see benefits to both. It is great to know we have this program to help us catch up to where we need to be with our math concepts! What is it? An online math help program called LearnBop. How much is it? For a single student – $14.95/mo. or $149.95 if you prepay for a year. For the family plan (up to 4 students) – $19.95/mo. or $199.95 if you prepay for a year.